related to 0001860 resolved Aroma1997 Using a wooden wrench on the machine. related to 0001856 resolved Aroma1997 The client can not display machines in the reactor. After the time is changed to an unknown structure. Rejoining the server fixes it, but it's only a matter of second before it bugs again. It is a client side bug. when it happens simply reconnect. It is not an easy thing to fix. as I said, it only takes a few second until it bugs, so reconnecting isn't really an option. Any progress on tracking that glitch? when it's on machine almost instantly turn into "invalid block" when it's off they're fine. Yeah, I've been getting this too. For me, it happens on nearby block updates within the same chunk (i.e. a tree growing, a rubber tree re-growing it's sap-spot, etc..). These Invalid TE's are also tanking my FPS... so I'm not sure what it is. I did notice that there was a lot of work done with consolidating all of IC2's Tile Entities from multiple blocks / block ID's with Metadata into one Block with NBT to distinguish machines and their properties. I have a feeling it's something regarding that, and maybe its updateEntity() method. Disconnecting and reconnecting doesn't always fix the issue. I've lost 4 machines so far because the invalid status became permanent. In the 2 attached pics, 2016-05-24_07.25.41.png happened when a rubber tree grew from a sapling. In 2016-05-14_13.15.25.png, this happened when I was taking apart the Simple Fluid Tank. I hate to think what would happen with a nuclear reactor. Its something hard to fix otherwise it would be fixed by now. The solution might require the re-writing of core classes so we will have to wait and see. Just had it again. Machines inside the same chunk as a rubber tree sapping went invalid when it grew into a tree while the machines just outside that chunk were fine. Funny thing is though, looking at these blocks with CraftTweaker (/mt block info) I don't see anything that makes them "invalid". In most cases the data seems to persist. Although it is a major issue, the solution may be as simple as something like a markBlockForUpdate() or markDirty() out of place. Edit: Tried breaking down the machines with an electric wrench. Lost 2 machines and 3 glass cables. For some reason all the data was cleared and CraftTweaker shows this for the block info. Note that this is the case where the machines become permanently invalid. Is anyone still here, who has this bug? yes. Had it yesterday trying to break down a machine with a partially charged electric wrench. Seems the wrench had a small charge, but not enough to break down the machine. So you know how to reproduce it? Have you tried growing a tree in the same chunk as a machine like oitsjustjose suggested? growing a tree does NOT reproduce it. For other cases, an IC2 rubber tree growing in the same chunk from a sappling can cause it. These invalid blocks do usually have the data though and will revert to their normal state. I don't know if their's some combination of factors required to reproduce this. But it isn't just the machine blocks but the cables as well. I've had it happen with different types of cables and powered from difference sources, so that doesn't seem to be a factor. Maybe instead of trying to reproduce it with a tree, maybe look at what a tree does when it grows. Does it force a chunk update? I'm going to try the latest build and see if I can get it to happen a bit more consistently. I think, I've tracked it down. I think, I've fixed it, but feedback would be much appreciated. It seems to be working in the latest build (industrialcraft-2-2.3.258-ex18). I tried the wrench quite a few times as well as planting and harvesting a number of trees. Might be too soon to call it fixed, but I so far I can't reproduce the problem. How did you manage to reproduce it? I never managed to reproduce it with Industrialcraft alone (never tried too hard either) if that's what you're looking for. However it's still happening in my modpack. When I turn my wheat farm on it breaks the machines in the same chunk. Just to make sure this is actually the same bug: when reloading the world/ relogging to the server, the invalid blocks are machines again...? Same machines (liquid heat exchanger, fermenter, geothermal generator, macerator, canning machines... probably all of IC²'s machines really) and yes relogging still fixes it for about a second. Will take a look at it. 2. Grow a rubber sapling with bonemeal. Аfter exiting and re-loading the save blocks 'come back' ... for a while. I managed to reproduce it, but I don't know where it comes from yet. Will take a look into it, once I have some free time again. I think, I just fixed it, can you give feedback with the newest build? I was able to reliably reproduce this issue, hence why I ended up here. A couple of machines just across a chunk boundary kept getting this issue as soon as I moved away. 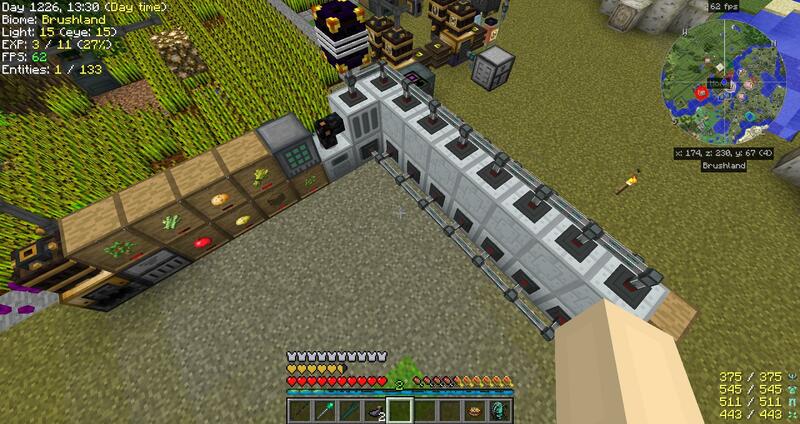 Anyway, I tried the industrialcraft-2-2.5.22-ex19.jar build on Jenkins and tried to reproduce it again. I can't. Also, cables used to, when first placed, be broken texture blocks, which also no longer seems to be happening, which is nice. Be good to hear from others who had this problem if it's fixed for them, and who knows, it could happen again when I least expect it, so other confirmations wouldn't be out of order. But I think you got it. 10 minutes into my world with my farm running (used to take 10s to bug machines) and no bugs so far. I think we can safely say this is fixed. Player reverted the change in 2.5.23, which is why emamboo can reproduce it but the others can't. Why did he revert the change? confirm. in 2.5.22 the bug is missing. everything works perfectly. Build 0000027: looking good, issue doesn't happen anymore where it happened before whenever a tree grew (Forestry farm). Seems improved, but I'm still getting magenta/black broken textures and unresponsive machines for the ones that are just across the chunk boundary. Not happening all the time, and seems to occasionally fix itself, but still an issue in build 27. Build 22 had completely eliminated it for me. Still an issue in build 29, except now when it breaks, it seems to stay that way. industrialcraft-2-2.5.32-ex19 has the bug, will try updating to build 40 and see if it's still there. industrialcraft-2-2.5.40-ex19 bug still present, as always reconnecting to the server fixes the issue. It took growing a single tinker's construct purple slime tree to cause it.